Don't take our word for it, Jimmy Buff's Italian Hot Dogs are considered among the best. Jimmy Buff's comes to Prudential Center's "Taste of Newark"
Capt. Scott Kelly, NASA US Navy Commander presented me with a Jimmy Buff's t-shirt that he brought with him on his Expedition of the International Space Station. The t-shirt was in space for 159 days. Best of all it was presented to me on my late Father's birthday. What a present. Forget the Game. Where Can We Eat at "THE ROCK"? The concessionaire is Centerplate, a company based in Stamford, Conn., that runs food operations at many major-league stadiums and arenas. At the high end of its 11 locations within the Rock is the Restaurant, (973) 854-8755, Extension 298, which serves a $50 three-course prix fixe with entrees like maple grilled salmon and veal chops saltimbocca. About half of its 350 seats are on a two-level balcony overlooking the arena floor. Things were slow at the Restaurant when I visited; not so at the two lounges, called Fire and Ice, which are open only to holders of lower-level club tickets ($200 at the box office, $150 per game for season-ticket holders, food included). Even closer to the action, they have hot-food buffets with dishes like barbecue chicken and swordfish piccata, along with carving stations and capacious bars. They were hopping throughout the game. Most of the concession stands offer the standard sandwiches, burgers and beer, but one stands out: Taste of Newark, on the upper concourse, an 80-foot steel counter staffed by representatives from several local restaurants, including Hobbys Delicatessen; El Pastor, a Portuguese spot in the Ironbound; and Jimmy Buffs, the locally famous hot-dog chain that got its start on Newarks West Side. Between periods, Buffs was busiest; the others had short or no lines. Still, Taste of Newark is a great idea. As Centerplates chief executive, Janet L. Steinmayer, told me in a phone interview, The thing that excites us about the Prudential Center is the opportunity to make it a celebration of Newark a walk through Newark, in a way. NEW JERSEY is a greasy state, food-wise. It has more varieties of inexpensive cholesterol-boosting foods than almost anywhere else on the planet. If you're hankering for something that's bad for you, from Taylor ham to Texas wieners to a hoagie from Wawa, you can find it in the Garden State. Morris County, however, is relatively greaseless. Sure, my home county has its share of diners, bagel shops and hot dog emporiums. For most of my time here, though, there hasn't been a signature eatery, a place for expatriate Jerseyites to make pilgrimages to once a year during the holidays, or somewhere that gets calls from soldiers in Iraq looking for airlifted goodies from home. There was no Rutt's Hut, no Whitehouse Subs, no Hot Dog Johnny's to occupy every one of my meals and harden my arteries. Until about two years ago, that is. That's when Jimmy Buff's opened in East Hanover, a mere 10-minute ride from my apartment. This was not good news for me. 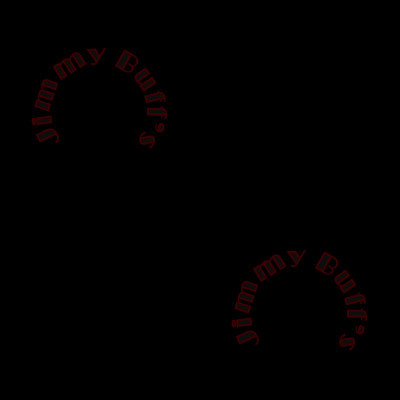 Not that I dislike Jimmy Buff's; in fact, I love it. For the uninitiated, Buff's serves the Paterson-Newark delicacy known as the Italian hot dog, a concoction that consists of a fried hot dog, onions, peppers and potatoes (often fried in the same oil as the dog), all stuffed into a pizza roll the size of a baby's head. I usually ordered what is known as a double combo, which has one hot dog and one sausage under the accompanying fried veggies. Usually after eating a combo, I'd either fall asleep or be overcome by what I call ''carb sweats,'' when my blood sugar would shoot up momentarily and give me a hot flash. 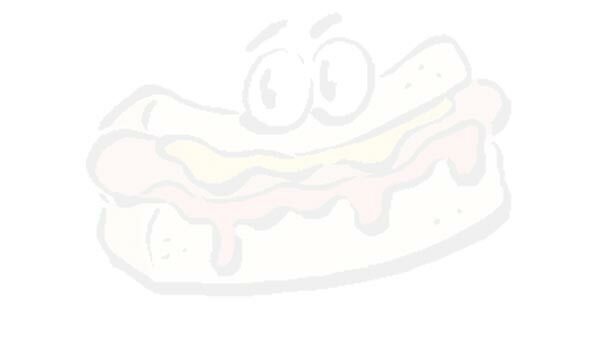 Suffice to say, a Buff's dog will never receive the ''Atkins Approved'' seal. Because the closest Buff's was 30 minutes away, I made the trip only once or twice a year. But now, it's right smack in the middle of my Saturday errand circle, making it a perfectly valid lunch option while I'm driving between Borders and Costco. Once the word ''Buff's'' enters my consciousness around noon, it takes all the mental and physical strength I can muster not to automatically steer myself toward that double combo. If I end up at the diner, or even Taco Bell, I consider it a small victory. But it doesn't end there. All I have to do is mention the place to certain friends, co-workers or other enablers, and the next thing I know, I'm keeping potato slices from falling on my shirt. Case in point: A few months ago, I was working in Parsippany and decided to skip the cafeteria to go out to lunch with some colleagues. We were heading to my car, intent on getting sandwiches, when I casually mentioned that there was a Jimmy Buff's nearby. So there we were, crammed into my little hatchback, heading up Route 10 to a rendezvous with a thousand calories of starch and mystery meat. But I wouldn't listen. While my mind was saying ''no,'' my lips were busy talking to the guys about Jersey's best places to eat, from the fire-pit hamburger places along Route 46 to the best place to get a steak. That's half the reason I go to a place like Buff's. Yes, it's a grease-lover's paradise, but it's also a place to relive memorable meals of the past, ones that not only had great food, but fantastic company as well. Maybe it was the time I took a long lunch and talked with my work buddies about game shows over pizza and beer, or some post-party fraternity sojourn to the local diner, or any number of significant events that would have never had as much meaning if they took place at some Denny's or McDonald's. So while I was sitting with the guys, devouring my fourth double combo of the month, the guilt I felt was overridden by the satisfaction that another good memory was locked away in the vault. I figure a few more points on the old LDL number are worth the good times. Joel Keller is a freelance writer from Morristown. WASHINGTON D.C., June 8, 2009 -- Jimmy Buff's has been selected for the 2009 Best of West Orange Award in the Italian Style Hotdog Restaurants category by the U.S. Commerce Association (USCA). Video shoot at Jimmy Buff's for upcoming Travel Channel show. Eat Your Heart Out - Chicago Tribune Chicago, can you believe it? I stopped at Jimmy Buff's in East Hanover the other day. My quest was to find an Italian Dog that I liked. The only one I had tried that I liked was at Mijo's. What I liked about that dog was that it was relatively dry and the potatoes were crisp. I prefer my potatoes to be crisp especially in things like hash browns and home fries. I had read some postings on this forum by Jimmy Buff and was inclined to give his recommendations a try. He recommended ordering a "dry sandwich" and the potatoes well done. This seemed to throw the lady at the counter who took my order - she did not seem to quite know what I was talking about, but she took the order anyway. Jimmy Buff's runs a Tuesday special of a double Italian dog for the price of a single. It was Tuesday so I ordered the double. 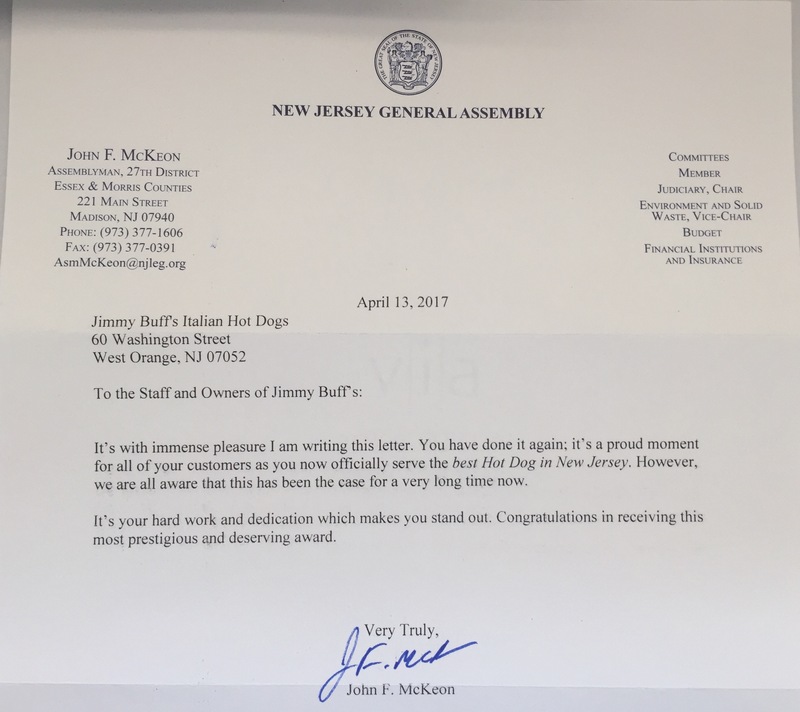 JIMMY BUFF'S (West Orange) - The aftereffects of the Italian hot dog, which Jimmy 'Buff' Racioppi of Newark is said to have created in 1932, may be the only symptoms that Alka-Seltzer can't relieve (and yes, we mean that in a good way). In the words of one devotee, Jimmy Buff's has been doing it right for so long that you just take them for granted. The double sausage with peppers, onions, and potatoes is so good that you'll order one to go just in case you can't go back the next day. Also in East Hanover, Irvington, and Scotch Plains. What a great web site and congrats on your 70th anniversary! I have been going to Jimmy Buff's since I was a little girl living in Newark (I'm now 55 yrs. old). My father had Sunday's off back then and almost every Sunday we would take a ride to Newark airport and watch the planes come and go then of course we'd stop for Jimmy Buff's to take home for dinner... one day my Dad asked me what I wanted on the role with my double hot dog, my response (as an 8 yr. old)....butter.....! My eldest son and I were at Jimmy Buff's this afternoon in West Orange. We go once a year when we visit the cemetery for Christmas. This time I brought home 9 sandwiches for family and friends here in Ocean County. Thank for 70 wonderful years of the best sandwich around. Thank you very much for sending me my Hot Dogs!!!!! I was 8 months pregnant at the time and had a very strong craving for Jimmy Buffs. I was born in New Jersey in 1972 and moved to California in 1981. I still remember going to Jimmy Buffs for lunch or dinner with my friends. I really missed the taste and had a craving. My father and sister also loved that I had you send the Hot Dogs!!!! It was a taste that made you feel at home!!! I love your hot dogs!!! Hopefully my daughter, Amethyst Rose, will soon be able to try one. She is now 6 months old/new. She is adorable and I am sure it is because I had Jimmy Buffs while I was pregnant. I had a Hot Dog five days in a row when I was pregnant. Hopefully we can do this again soon.